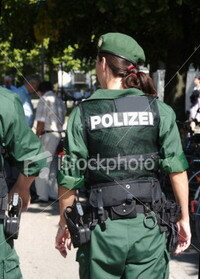 German police investigate the killings of six Italian men in a suspected feud between criminal gangs. They had found nothing worth from an initial examination of poor-quality footage of nearby security cameras. The Italians, aged 16 to 38, were shot and killed early Wednesday after they left a birthday party at an Italian restaurant in the city of Duisburg. Police have said a witness saw two men running from the scene to a large dark sedan before being driven away by a third man at speed. In a statement Friday, police said they would continue working to enhance the footage and results could only be expected after the weekend. It said the footage had not so far provided results "that currently suggest that publication would promise success". Officers said they had received several tips from the public after releasing a composite picture of the suspected driver of the getaway car, but none that directly identified the man. Police late Thursday released the picture and said the man was about 180 centimeters (5' 9") tall, of slim build, with short black hair and relatively long sideburns, with a dark mole under his right eye. The tips "relate not just to one person, but thus far to a wide circle of people," their statement said. Officials say the most likely motive is a rekindled feud between two criminal family clans from San Luca in Italy's Calabria region, believed to be part of the 'ndrangheta syndicate. Two victims have been identified as members of the Pelle-Romeo clan but it is not yet clear whether the others were as well, police said. The 'ndrangheta is linked to crime around the world, and today is considered even more dangerous than the Sicilian Mafia.